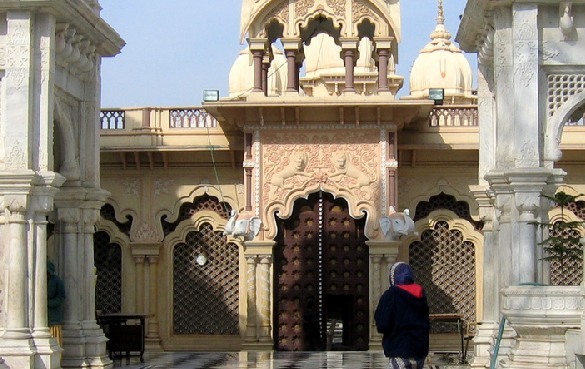 "Mathura is the abode of Lord Krishna and it has a great religious sanctity among the Hindus. It also has one of the oldest historical records. Even Mathura is mentioned in the epic Ramayan. It is on record that Mathura was one of the capitals of Kushan King Kanishka(130AD)." Just an hour’s drive from Agra, on the banks of the river Yamuna, is situated the birthplace of Lord Krishna. The entire land is dotted with magnificent temples, dedicated to various aspects of his life. The twin cities of Mathura and Vrindavan, where he was born and where he grew up, still resound to the sound of his laughter, antics and his magical flute. Gokul, Barsana and Goverdhan are the other township associated with the legend of Lord Krishna. Gokul is the hideout where Lord Krishna was secretly brought up- away from the eyes of his maternal uncle Kansa. His consort Radha belonged to Barsana, where the unique Holi festival Latthamar Holi is celebrated with great gusto. At Goverdhan, Krishna raised a mighty mountain on his little finger to protect the locals from the wrath of rain-god Indra. The twin cities of Mathura and Vrindavan are about 56 km from Agra. In and around this heart of Braj Bhumi are spots and symbols that may immerse your trip in spiritualism. The twin cities personify the legend of Lord Krishna, with folklore, cultural traditions and even day-to-day life are imbued with a divine presence. Amidst the mesmerizing temples, gardens, music, art and dances the legend of Lord Krishna comes alive in all its colour and glory – every day. The Charkula dance, Raasleela and the lilting folk music recreate the aura of devotion and love.